Re: From *.tap to datasette. You can use the audiotap to record tap files to cassette tapes. 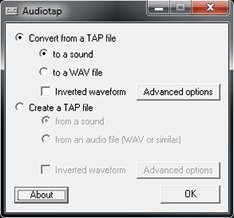 Select "Convert from a TAP file" and click on "to a sound" same as the picture above. Click OK and choose the TAP file.Press record and play on the datasette. If you want to record T64,PRG,P00 images,you need to use WAV-PRG program. Wow, you made me happy with this info !